This is a selection of hymns about Saint Francis Xavier, who the church remembers on 3 December. Because this feast day is during Advent, it never takes precedence over the Mass of the day. Therefore the hymn suggestions are either directly about Francis, or based on the themes from his/her life and ministry. Francisco de Yasu y Xavier was born at Xavier in Navarre in the Biscay, northern Spain in 1506. After study at the the University of Paris, in 1534 he joined Ignatius Loyola as one of a small group (5 or perhaps 9) people in making vows at Montmartre - the beginning of the Society of Jesus (Jesuit) order. After being ordained as a priest he was sent as a missionary, firstly to Portugal and then to Goa in India, which at the time was under Portuguese rule. Despite facing considerable challenges , he learnt the language and ministered there, also travelling to Malacca to minister to people who had been baptized, but not instructed in the Christian faith. His is credited with teaching the faith in Goa by writing simple catchy verses in the local language which contained key messages of the Christian faith, and setting these to local popular / folk tunes. In 1549 he went to Japan with after meeting a Japanese expatriate (Anjiro, later baptized as Paul). The intial mission to Japan included Xavier, another Jesuit priest and three Japanese converts, and Xavier is credited with being the first person to preach the Gospel in Japan. Overall he is estimated to have made around 2000 Japanese converts. In 1551 he returned to Malacca and shortly became provincial of the Indian province of the the Jesuit community. He became determined to teak the Gospel to China, which was at the time closed to outsiders. He bribed a ship's captain to smuggle him into China, but had barely arrived when he became ill and died on 3 December 1552, aged 46. His body was returned to Goa for burial. He is know for having a gentleness of spirit, which continued right to his death, and preaching the Gospel with great energy and zeal power and effectiveness. He is sometimes portrayed as having a Cross in hand, and a burning zeal in his heart. . Some estimates of the number of converts he personally baptized vary are as high as in the six-digit range. Some people claim that he preached to more people than anyone since New Testament times. He was canonized in 1622 and, alongside St. Thérèse of Lisieux, was declared patron of missions in 1927. He is also patron saint of a number of countries (including Australia, Borneo; China; the East Indies, New Zealand, Indonesia, Malacca, Malaysia, Mongolia, Sri Lanka), dioceses in many countries - and navigators. Devotion to him in Goa, India, and among Goanese people throughout the world, is particularly strong. 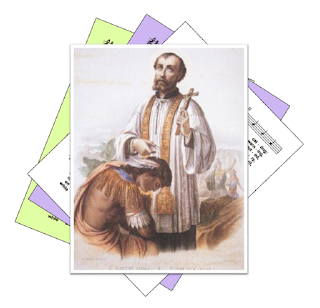 St Francis Xavier is remembered in the church's calendar with a memorial, not a full feast day, For this reason Masses on the day usually use the readings of the day rather than specific ones for the feast. There are some exceptions - eg in places which use the Jesuit calendar. Check local sources find these for your area. A witness to your Gospel on many far-flung shore. And bring us ever closer to You in heaven we pray. There are many hymns in the Konkani language dedicated to St Francis Xavier, because of his work in Goa in India, where he continues to be known as Goemcho Pai (Father of Goa). These include the eighteen-verse Sonvsarak Jezu Diat by Goan Roman Catholic (Jesuit) priest Fr Vasco do Rego (ref). I have not attempted to list these - if you know of a good summary list which I could link to, please leave a message in the Comments box near the bottom of the page.